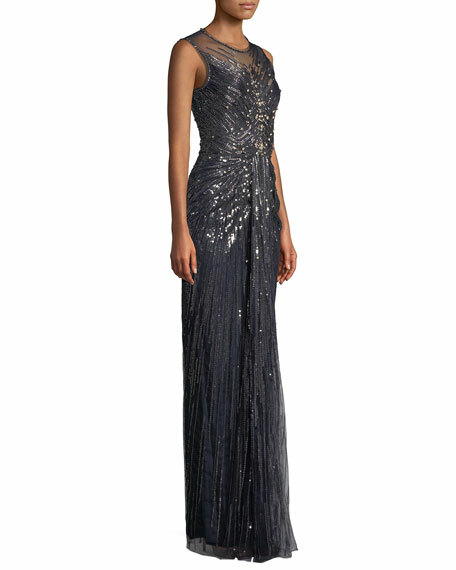 Jenny Packham beaded embellished evening gown. Black Halo sateen evening gown. Approx. length: 59"L down center front, 58"L down center back. Asymmetric cowl neckline. Cap sleeves. Carolina Herrera gown in silk taffeta with floral sparkle embroidery. Shirt collar; button front. Three-quarter sleeves; tie cuffs. Banded waist. Cushnie et Ochs 4-ply silk crepe. Jewel neckline. Circle opening at front with shirring. Long bell sleeves. A-line silhouette. Floor-sweeping hem. Dry clean only. Made in USA of imported materials. Model's measurements: Height 5'11"/180cm, bust 32"/81cm, waist 24"/61cm, hips 35"/89cm, dress size US 2.